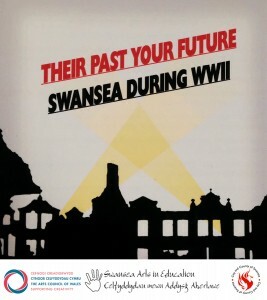 This is an interactive project initiated by Swansea Arts in Education. It allows the Year six children of feeder primary schools to express and record their concerns about moving onto secondary education. These concerns are animated on the disk with animated responses provided by the Year 7 pupils already in the secondary school. 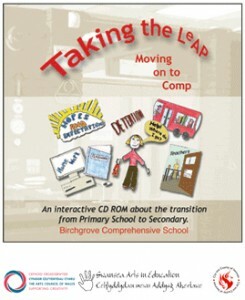 The disk also includes a virtual tour of the comprehensive school and all its subjects being taught. This, alongside other elements of the schools' transition plan, provides answers to many of the questions the younger children have in an entertaining way that informs both the pupils and their parents. An exhibition with details and options for this project, which is still available to schools, can be seen on the LeAP Transition project website. This bi-lingual interactive disk was produced with the help of 1st Llangynidr Guides, 1st Talybont Brownies and Tanlybont-on-Usk Energy. The guides and brownies took part in every aspect of the project. 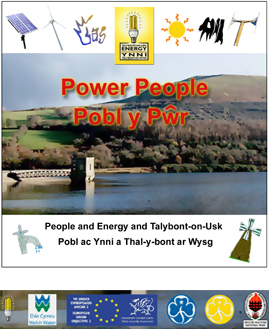 The CD ROM focuses on the Talybont Hydro Project but looks at many aspects of sustainable energy production and efficient energy use that are relevant to everyone. The disk uses video clips, photography, animation, interactive games, interviews and more to present wide range of information about sustainable energy production techniques, fossil fuels and the history and development of the Talybont-on-Usk hydro electricity project. The full interactive production is downloadable for Windows here. See a selection of screen shots from the disk here. This interactive disk was produced by Alastair Duncan for Swansea Education Effectiveness Arts in Education with Cas Llwchwr Primary School Year six pupils. The children visited Swansea Museum to view the 60 Years On exhibition and interviewed seven veterans of World War II. These included evacuees, an air raid warden, a fighter pilot, a rear air gunner and a naval officer. The children recorded, illustrated and animated their stories and created their own sound effects to accompany presentations about air raid shelters, the Home Guard and ARP, the blitz on Swansea, evacuees, entertainment and much more. The disk was designed to allow future research about this subject by other pupils and was distributed to other Swansea schools through Theatr na n'Og. 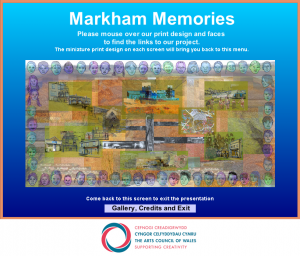 Alastair Duncan worked with Year 5 and 6 pupils at Markham Primary School on this school and community project. The children developed a large format print and used the image as the navigation screen for an interactive disk. The disk features the children's observational drawings of their village as well as animations illustrating stories from the local inhabitants about the history of many aspects of the local community. The children also recorded some of their own memories which helped them to compare their lives to those of the elders in the village. Aspects of local history investigated were childhood, Markham Colliery, school life, shops, entertainment and landscape. They also demonstrate how they went about designing their large print using Adobe Photoshop. This interactive disk and large format digital print project allowed the children to develop their skills in research, design. illustration, observational drawing, creative writing, photography,sound recording, presentation, organisation and much more. "This project covered all aspects of our Geography curriculum for Years three and four, and many of those for ICT and Art" Colin Jones, Head Teacher. A larger image of the print can be seen on the Print Project page. 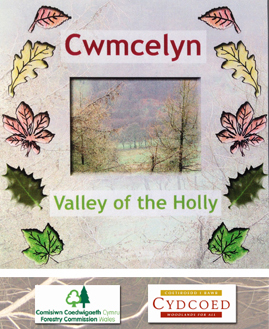 This project was commissioned by the Cwmcelyn Tenants Residents Association in conjunction with Cydcoed and Forestry Commission Wales. Three schools worked with Alastair Duncan to research and produce the interactive CD ROM and the large format digital print that hangs in the schools and community. The disk provides an interactive timeline of woodland in the UK starting 310 million years ago. Children from 7 - 11 years of age focused on different aspects of their local woodland - the forest floor, the trees and the wildlife and sounds of the forest. Using sound recording, video, photography, illustration, animation, interviews, poetry and games, the children present the findings from their research into this natural environment in detail. See a selection of screen shots from the disk here or you can download the full interactive presentation here (Windows only - the download is a.zip folder containing an .exe file which has been thoroughly tested for malware and viruses. Apple stopped supporting .osx applications with OS X 10.7 Lion. However, if you have Parallels on your Mac, this will run the application). 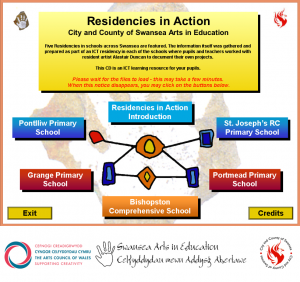 This interactive CD ROM features artists' residencies in five schools across Swansea. The information itself was gathered and prepared as part of an ICT residency in each of the schools where pupils and teachers worked with resident artist Alastair Duncan to document their own projects. The disk is an ICT learning resource for pupils and includes videos, images and sound recordings of resident artist workshops in a wide range of media. Other productions by Alastair Duncan for the Education Effectiveness Arts in Education Team include "My Square Mile", "No Ordinary Cupboard", "Primary Democracy" and others. This is one of several projects which combined the designing and weaving of a large communal tapestry with the production of an interactive CD ROM about the the project itself and all the various aspects of making the tapestry. The project involved the whole school and the Year six children, once shown how to include video, sound and animation in a Powerpoint presentation, compiled their own screens to present all that they had worked on. Aside from learning to weave, this included, drawing, graphic design, text development, presentation and sound recording. This major HyperAction project was managed by Sue Williams and directed by Alastair Duncan who led a team of artists and degree students to produce this wide ranging and in depth presentation and classroom resource. Children from five schools and the crews of five RNLI lifeboat stations along the South Wales Bristol Channel coastline worked with HyperAction to create seven animated videos about local shipwreck stories. They also researched and created detailed interactive presentations about the lifeboat stations, industrial, social and geographical aspects of South Wales and produced exciting games and quizzes to help deliver an engaging resource for the classroom. A touring exhibition about the project was launched at the Waterfront Museum, Swansea and finished at the Pierhead Gallery in Cardiff Bay.